UML-Maoist Center unify: Unified party will be named 'Nepal Communist Party' - Integration Through Media ....! 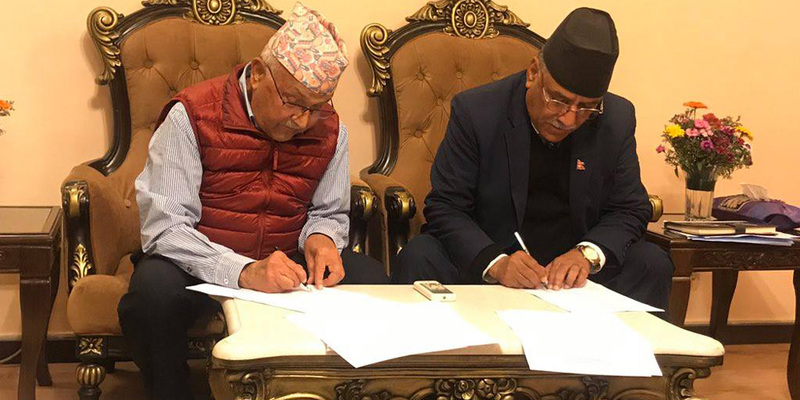 KATHMANDU: The Communist Party of Nepal CPN-UML and Communist Party of Nepal (Maoist Center) have agreed on unification of the two parties and signed a seven point agreement on the modality of the unification. The seven point agreement jointly signed by leaders of Communist Party of Nepal CPN-UML and Communist Party of Nepal (Maoist Centre). The statement further says that Marxism Leninism will be the guiding principle of the party. Chairman and Prime Minister (PM) KP Sharma Oli, Jhala Nath Khanal, Madhav Kumar Nepal, Bam Dev Gautam and Ishwor Pokharel have signed the agreement on behalf of UML whereas Maoist Chairman Pushpa Kamal Dahal, senior leaders Narayan Kaji Shrestha and Ram Bahadur Thapa have signed the agreement on behalf of the Maoist Centre. The agreement has been signed on conclusion of the Party Unification Coordination Committee held at Baluwatar this evening. Several rounds of one-on-one talks were held prior to this agreement between the chairmen of both the parties. As per the agreement, People’s Multiparty Democracy (Janata ko Bahudaliya Janawawd as propagated by later UML leader Madan Bhandari) and Maoism will be deliberated upon as the ideological lines of the party at the general convention of the unified party. KP Sharma Oli and Pushpa Kamal Dahal will co- chair the party in a bi-chairman system until the general convention and then both will take turns in leading the government. Likewise, major party units–politburo, standing committee and central committees will be vertically merged including the committee members.